Leo McMahon is one of the almost forgotten early day actors and stuntmen. Born November 11, 1913, in Sonora, CA, his mom was Mexican and his dad Irish. The family owned a ranch in Sonora where Leo grew up and was to become an expert cowboy and horseman. In the ‘30s the ranch was to become a favorite location for many westerns filming in the gold rush country. Harry “Pop” Sherman, producer of the Hopalong Cassidy westerns, shot “Heart of the West” (‘36) on the spread and induced the reluctant Leo to take a role in the film. Sherman then persuaded McMahon to go to Hollywood with promises of turning him into an actor, but a dispute between the pair ended that arrangement in ‘39 after McMahon had appeared in 13 Hoppy features. He later returned in ‘47-‘48 to do two more when William Boyd was producing the Hoppy films. McMahon did stay in Hollywood though, and was soon working as an extra, double and stuntman including six with Tim Holt at RKO. His way with horses earned the respect of the already established cowboy contingent with whom Leo worked. 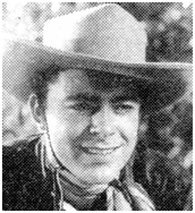 Jack Montgomery, father of famous child star “Baby Peggy”, was one of the veteran cowboys to befriend Leo; even living with Montgomery and his wife, Marian, for awhile. Throughout WWII, McMahon served as a bombardier and tail gunner with the U.S. Army Air Corps’ Flying Fortresses. He flew dozens of hazardous missions over Europe, being wounded on one of these. The proud recipient of a Purple Heart, Leo returned to Hollywood needing the help of a cane. He soon married, bought a home in North Hollywood and picked up his career doing stunts, eventually working his way up the ladder of success as a second unit director. During a furious chase scene, his team of horses panicked and ran away with his wagon team as Leo ploughed into an immovable tree. Badly injured, this stunt effectively ended his career; he could no longer ride or do stunts and suffered a lot of pain. Leo tried his hand at screenwriting with one of his screenplays filmed as “Madron” with Richard Boone in the lead. The accident that ended Leo’s stunt career severely injured his liver causing him to perform mundane tasks standing up much of the time. Even though the stunt business severely injured Leo, he survived until October 31, 1995, passing away at a N. Hollywood hospital, just two weeks before his 82nd birthday. All of us that have chosen to go into the stunt profession owe great debts to pioneers like Leo J. McMahon.